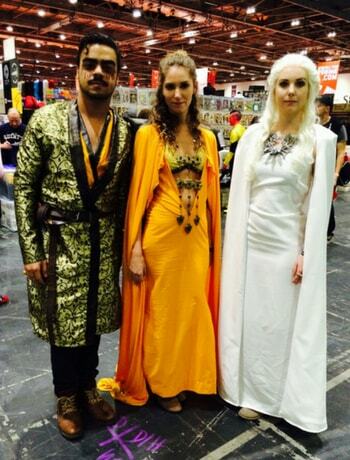 We at EED attended the cool and crazy Comic Con London on the opening day of the 3 day event. 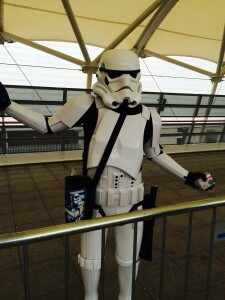 As soon as we arrived at the event we were greeted by a welcoming Storm Trooper. 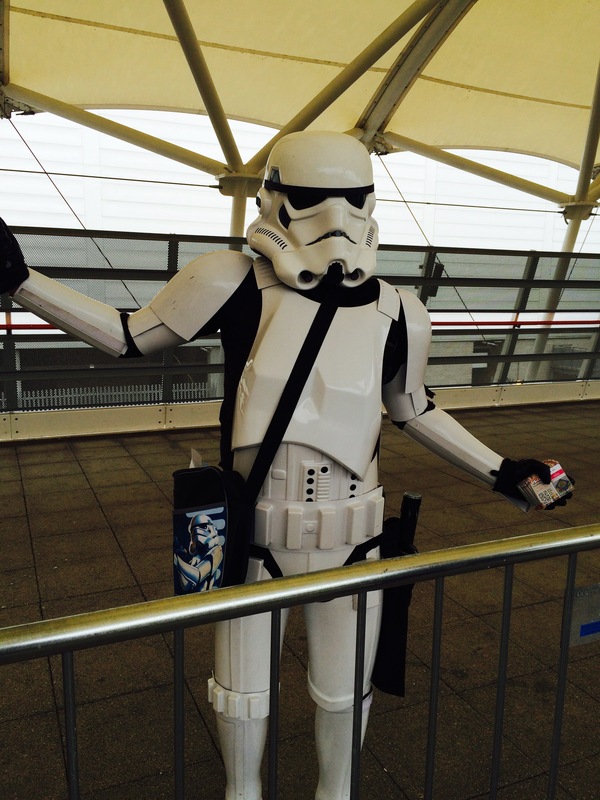 When we entered the Excel Centre we were amazed by the amount of effort the attendee’s had gone to with their costumes- it was every Comic fan’s dream under one roof. Game of Thrones watch out we may have a new cast in line! The space for the event was so big that it took us a good few hours to make our way round to all the stands. 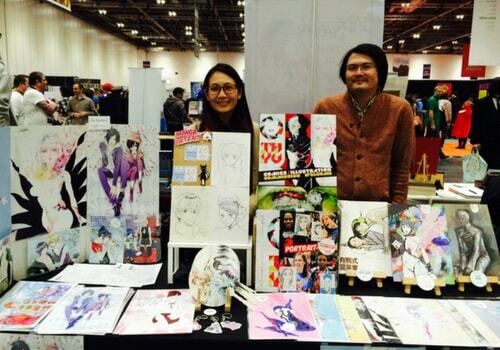 We particularly were drawn to the Comic Village area as there were many up and coming Comic talents on display. Tom’s profile: It is Tom’s first year at ComicCon so he has his space secured for the whole weekend to gain full exposure. 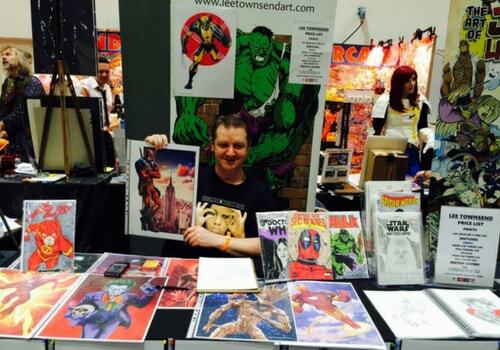 Tom is at ComicCon as he has all the right audience under one roof, if he had the space he would of liked to make his stand bigger and include more of his work. As it’s his first year he is testing out the exhibition waters. 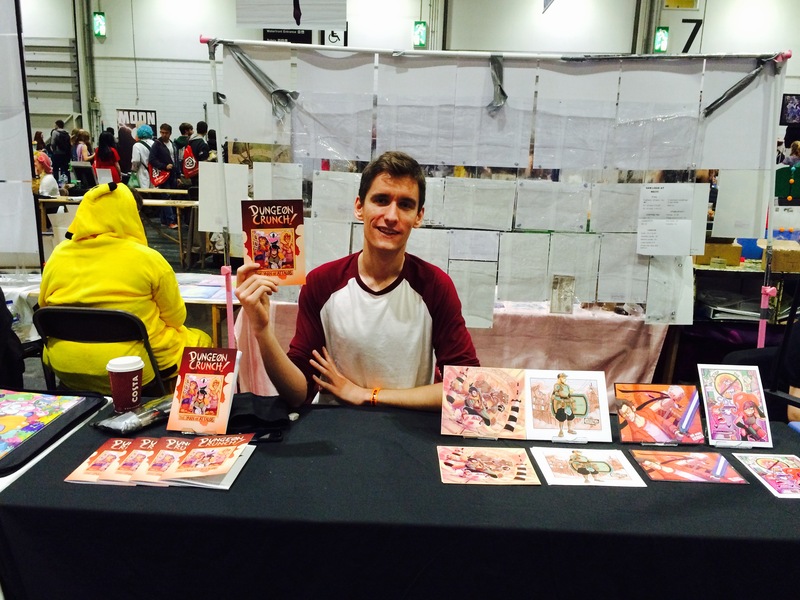 Richard’s profile: This is Richards first time at London Comic Con, although he has showcased at Birmingham before. 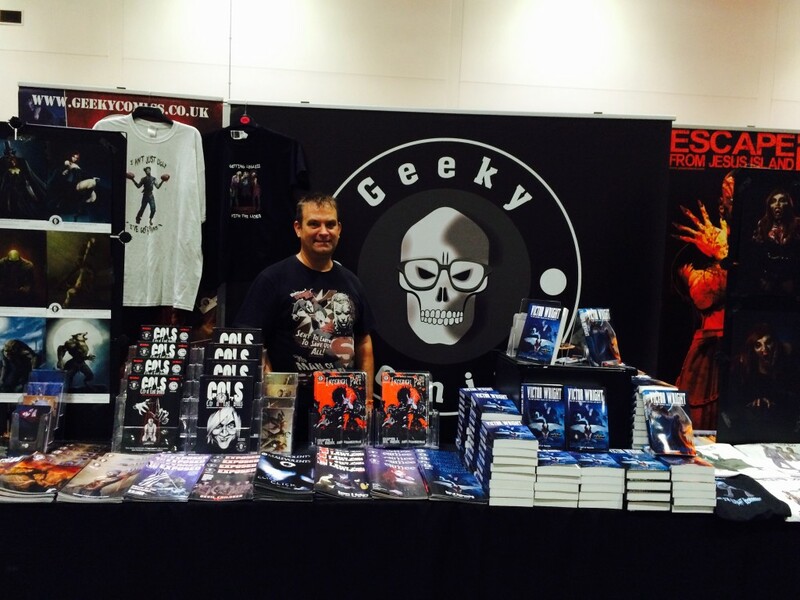 He has had repeat customers from the shows and continues to expand his customer base whilst at Comic Con. Richard spontaneously plans the framework of his stand on the day. Victor’s profile: Victor showcases at a lot of exhibitions and has been doing so for years. As he is a self publisher, it gives him access to a large captive target audience. Victor would of liked to have a bigger table space to make more of an impression, he has masses of experience with setting up his stand but is always keen to try new props to make it even better. His chosen prop for his stand would be: there are many things Richard listed- change of tablecloths, double banners, bigger display racks– the more the better! Lee’s profile: Lee shows at most of the MCM’s every year as it gives him great brand exposure. He lays his stand out in the same way almost every Comic Con but would like to have a bigger space to showcase more of his work. 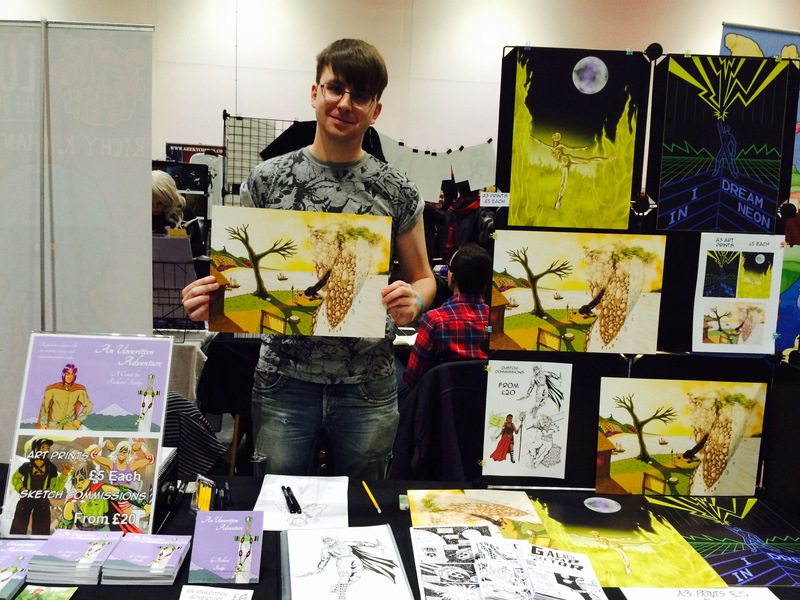 Lioma’s profile: Lioma has been showing her work at Comic Con for over 4 years now and believes it is the best platform to showcase her talents. She sets up a mock up run of her display at home to make sure it appears the way she wants it to on the day of the event. Improvement for Lioma’s stand: Lioma wants to build height to her stand so she is thinking of getting some Display Boards to achieve this. Celeste and her team show at Comic Con whenever it is on every year, as the story of the comic zombies hate kung fu is a rather unique one, the show is the perfect opportunity to show the story in detail. The stand has been designed with lots of colour to capture visitors attention. The stand is usually set up on the day with a little improvisation to get it looking in tip top condition. 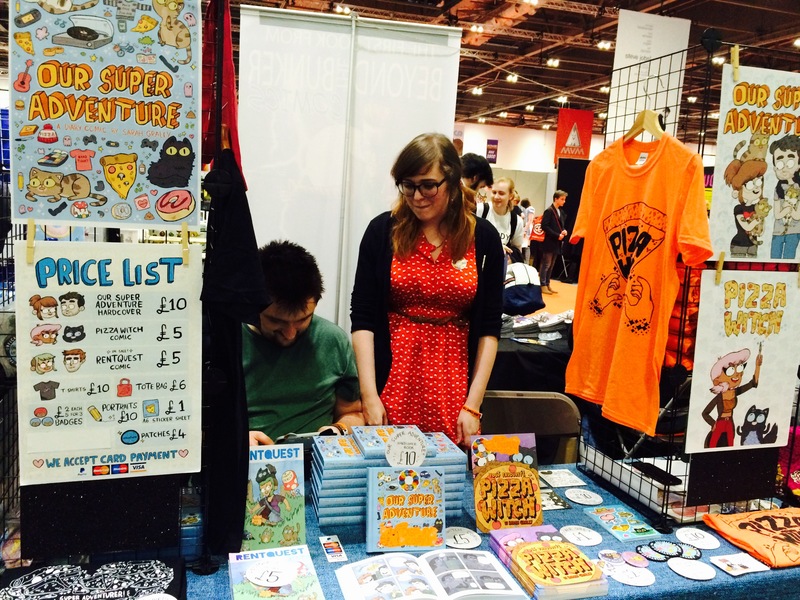 Celeste would like Display Boards and more props– as well as a bigger area to promote the stand. 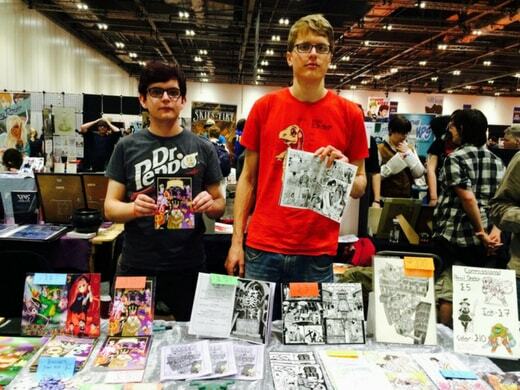 Jack and Tom’s profile: Jack and Tom both work on separate projects but share a stand to showcase their work. They have shown at many of the ComicCon shows and particularly like the London show as more people attend due to its size and exposure. They tend to set their stand up on the day without much planning but would like to expand on size to show more of their work. Next props of choice would be: Display Boards to show more comics. 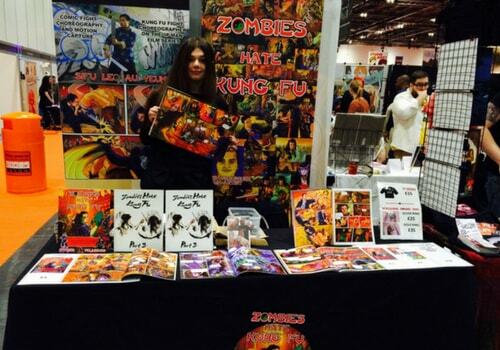 Sarah’s profile: Sarah is at MCM shows every year as she gets good exposure with the right audience. She plans her stand per convention but has become a pro due to her years of experience. Sonesh’s profile: Sonesh has shown his work at ComicCon for a few years as he finds it a good way to meet people face to face. He said it’s good to show the “talent behind the books” which we couldn’t agree more with. 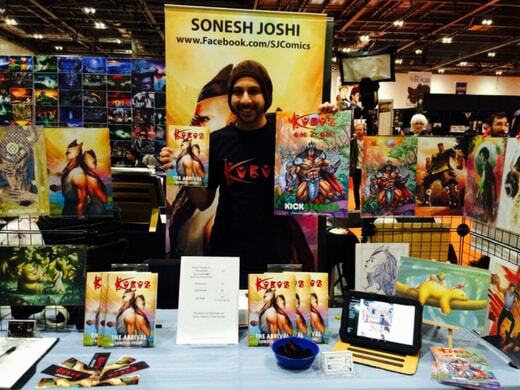 Sonesh actually spent a few hours doodling how he wanted his stand to look- very impressive! He has the OCD effect perfecting his stand to look its best. Somesh would like a flag to make people notice his stand from a distance, which would bring them directly to his work. Nathan’s profile: Nathan attends as many shows as he can to showcase his work- he plans his stand in advance for ultimate impact. 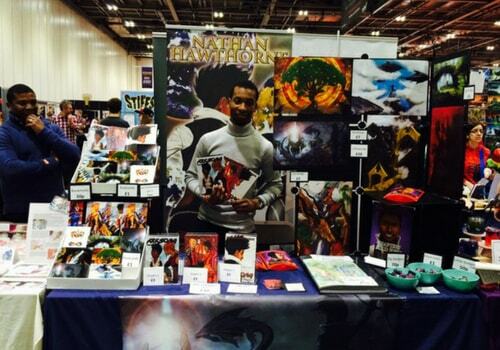 Nathan is happy with the set up of his stand, he would just like it to be even bigger. Nathan would also like his artwork printed on his tablecloth for bigger impact. As well as speaking to the talented folk at Comic Village, we were amazed by the amount of effort visitors had put into their costumes, here is our captures of the day, enjoy! If you’re an artist who is looking to showcase their creative flair, take a look at our range of products and why not think about showcasing at next years ComicCon yourself?